John Drylie was born in Fife County, Scotland in Sept 1853. He married Isabella Hamiltone Frame in 1876. The couple had two children (Marion, b. 1882, Elizabeth, b 1884). On November 28, 1886, the Drylies arrived at the port of New York aboard the ship Nevada; John’s occupation was listed as “Miner.” By 1889, they were living in the town of Gilman, where the senior Drylie found work in the coal mines. 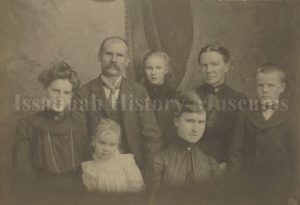 Three more children were born to John and Isabella: Anne, b: 1891, Thomas, b. 1893, and Ruth, b. 1898. John Drylie served as town marshal from 1906 until 1908. Before and after his tenure as marshal, Drylie worked as a coal miner. Sometime between after 1910, Drylie changed professions. In 1920, Drylie, age 67, was working as a road foreman during the construction of the Sunset Highway.